Why: Eyebrows in need of pruning and preening? Mine too. And my trusty Tweezerman Slant Tip Tweezer has always been my go-to plucker for it’s extra-easy precision tips and nice grip. 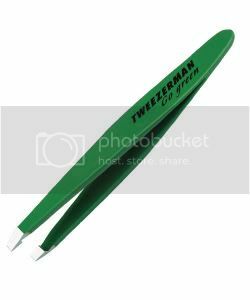 Now Tweezerman is offering the special-edition “Go Green” Mini Slant Tweezer, a mean, green mini-tweezing machine (packaged in 100% post-consumer recycled paper). For every tweezer purchased, a new tree is planted and a dollar will be donated to the National Arbor Foundation. Why pluck with anything else?